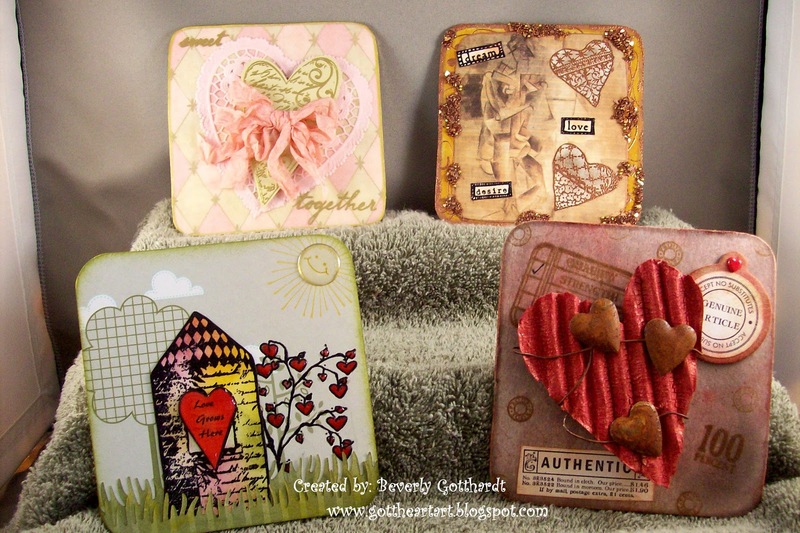 I'm participating in my first art exchange at Gingersnap Creations. This was a perfect exchange for me to start with because the theme was to include hearts on your beer mat or coaster, since I collect hearts no shortage here. Hope whoever gets these likes them and I'm very excited to see what I get in exchange. I'm heading to the post office and then to rehab to be with my Mom. She had another small stroke over the weekend, but was back at rehab Sunday evening. She is participating and her mind is still pretty clear, but her physical stamina is in pretty short supply. Thank you all for your prayers and thoughts, the next 10 to 15 days will be very telling and then we'll have to make some more decisions. If you want to know how any of these was done just email me granybg@yahoo.com and I'll get emails answered after I get home in the evenings. Wow- all of your coasters are beautiful! You are very talented! Your coasters are lovely and all so unique. Good luck with your mom... I've been in that boat and it's a rough ride. Hoping she improves readily! I click on the picture and got a better view - These turned out really pretty!! And sending happy thoughts/prayers your way! These are all so beautiful, Beverly - I love how each has its own distinct personality. Fabulous styles on all of them. Good luck with your mom, I hope she's doing better each day. All of your coasters are so beautiful. All the best wishes for your mum. I love them all. So very lovely. Hope I get one! My prayers are with you for your mom.Take care, Gerri. Wow! Those are great, Bev!